Beijing Design Week 2011: a menu charting the water footprint of different dishes was presented to diners at a Beijing cafe during design week. The how much water do you eat? menu displayed silhouettes of existing popular dishes at the Tian Hai cafe alongside a calculated breakdown of water used to produce the ingredients for each. Information boxes in the booklet explain why roast duck uses the most water and why candied banana uses very little. 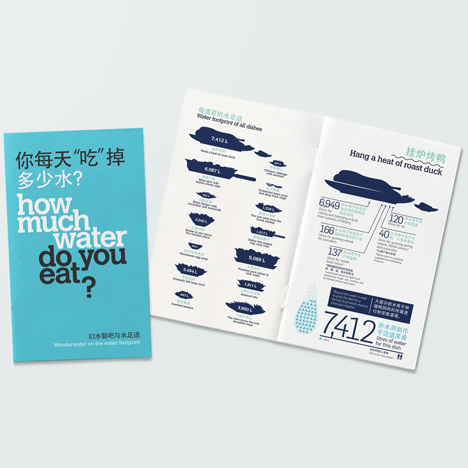 Elsewhere in the menu, graphs illustrated the water consumption of China compared with the global average and a chart showed customers the water footprint of an average person. The Beijing Design Week event was a prelude to another that will take place at World Design Capital Helsinki 2012 and was curated by Helsinki Design Week founder Kari Korkman and design consultant Jane Withers. A research group at Aalto University produced the information. See more projects from Beijing Design Week here, including a pop-up teahouse with a heat-sensitive colour-changing table, and see our snapshots from the festival on our Facebook page. The Wonderwater project is a series of events that will be seen and experienced in and around Helsinki in 2012. The masterminds behind the concept are Helsinki Design Week’s founder and producer Kari Korkman and consultant, curator and design journalist Jane Withers who is also a member of Helsinki Design Week’s advisory board. For Beijing Design Week, Helsinki Design Week and Aalto University Design Factory will bring a preview of the project to Dashilar with Wonderwater Café, achieved through a collaboration with the local Tian Hai restaurant. Among other things, Tian Hai’s menu will be redesigned such that customers will be able to see how much water goes into producing the ingredients of many of its most popular dishes, so as to to raise awareness of the water footprint and inspire the visitors to consider the environmental effects of locally and globally produced and distributed food.